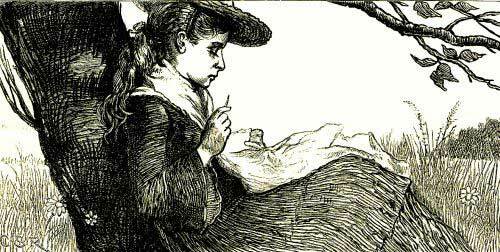 A young girl sews under a tree in this vintage black and white drawing. This great arts and crafts image is in the public domain and can be free downloaded and used in your next arts and crafts project. This children’s illustration appeared in Harper’s Young People on November 25, 1879; no illustrator was credited.